Though lot of formalities of Seemantham are taken care by Pandit (Sasthrigal), the family members also have to be prepared with the rituals that are followed in their families. Seemantham is performed on the 8th month of pregnancy (Tamil month). 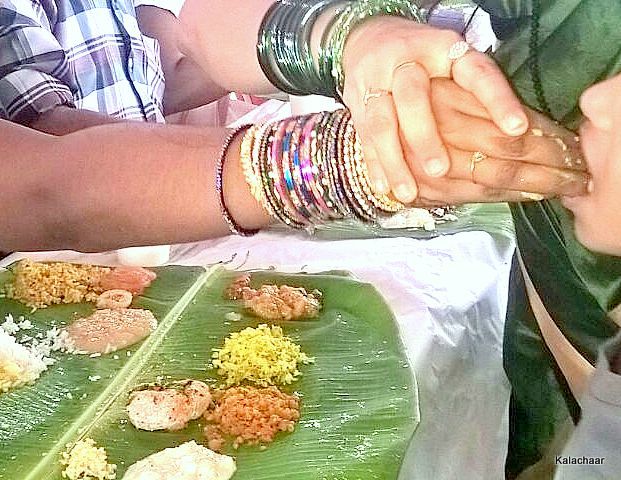 After Valaikaappu function is completed in the morning, the pregnant woman along with her husband will be dressed up with traditional wear for the next occasion Seemantham. The pregnant woman and the lady (thunai manai), who accompanied for Valaikaappu, will be offered with some food. I had idly brought from my uncle’s home. In my sister’s family, they give Pongal and Vadaam to the both ladies. First ritual is the Uthagashanthi performed by the priests. They chant Mantras and make the water in the Kalasam sacred. The pregnant woman has to change the saree and be prepared for Abishekam with the sacred water in the kalasam that was kept in the Pooja. Husband has the privilege to pour the water on her wife. Songs are also sung at that time. Since the Pregnant woman used to wear her Koorrai pudavai at the time of the function, she has to change the saree before Abishekam. Upon completion of Abishekam, the saree that was worn during Abishekam will be offered to a Sumangali lady. Manai Palakai decorated with Kolam is required during Abishekam. The ritual of squeezing drop of a mixture (explained below) is also performed by her spouse. The mixture will be tied at the end of the saree and squeezed into the nose of the pregnant woman. It is very small drop that won’t harm the woman while inhaling in. This ritual will not be seen by all the invitees of the function. Usually, a saree will be used to hide the event. This function is mentioned as Mookku pizhidhal. While doing this the woman should not sneeze. It is also believed that the delivery will be safe if Saree used for this ritual (usually the saree worn during Marriage) is worn for a while when the delivery pain starts. People who belong to Yajur Vedam will mix alam mottu and milk and blend it in stone mortar. People following Rig Vedam use Arukampul (Bermuda grass) and milk to prepare this mixture. This ritual is done by girl Children who is yet to attain puberty (kanya pengal). While blending the mixture the girls used to tell “Aambala petha Pombala Petha”. Elders used to follow an interesting ritual during this function. Sprouted green moong dhall, Appam and Kozhukattai will be prepared and put together in a cover and tied in the Saree (Madi kattuvadhu) of the pregnant woman. Again odd number of Appam and Kozhukattai should be placed in the cover. A small child will be asked to pick any one from the bunch of Appam and Kozhukattai. If the child picks an Appam, it is believed that a girl baby is expected and a boy if Kozhukattaiis picked. While the pregnant woman eats her lunch in the afternoon, she has to feed a small portion of Dhall rice mixed with Ghee to a small child. Elders usually prefer a male baby to accept the feed. Achutham Thelithal is also an important ritual followed in the function. Milk and honey mixed together in a small vessel will be sprinkled gently on the lower hip of the pregnant woman using flowers. Flowers dipped in the mixture will be sprinkled by elderly ladies. 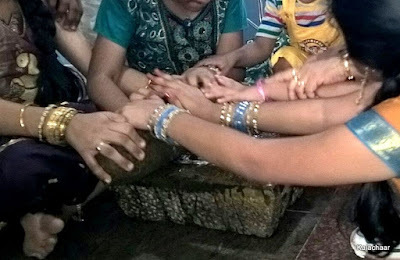 The pregnant woman has to bend down to enable the elders to perform this ritual. In the evening, elders conduct a function called Poochoottal. Sister in law of the pregnant woman offer flowers to the pregnant woman, gift a saree or something as per her wish. Songs are also an important part of this function. At the end of the function Aarthi is taken. One more interesting procedure that is followed during the function is that, sis-in-law of the pregnant woman utters the below stanza in the ears.
" Manaa Panaa Kettukko, Vayittru pillai Kettukko, Sakkarai kuttiye Seekkiram vaa"
Very nice blog, Mythili. I also remember one more ritual followed during seemantham. Mullampanni mull (Porcupine quill) is taken by the husband. And he has to draw an imaginary line starting from the wife's navel right upto the hair partition (vagudu) and throw the quill behind her. Did you have this ritual? Yes Anuradha. We have this ritual. This is usually taken care by the sastrigal.